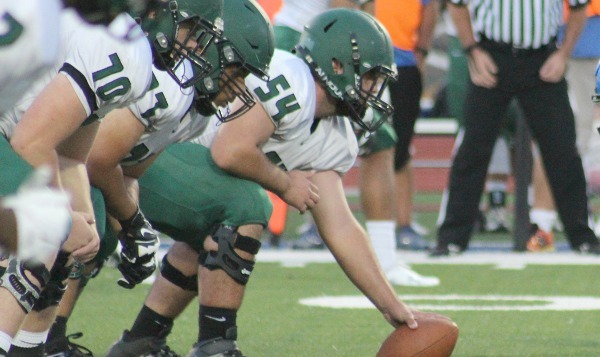 The new Class 5A/6A playoff format that ended district play partially allowed this matchup, between the AVCTL’s Derby and City League’s Bishop Carroll, to occur. Normally, both teams would be locked into league schedules at this point in the season. Derby is the defending 6A champion, while Carroll is the returning 5A runner-up. Derby pulled away for a big 46-20 victory at rival Hutchinson last week. The Panthers converted three first-half turnovers into scores. Derby, the No. 1 team in 6A, is considered, along with 6A No. 2 Blue Valley, as two of the state’s best squads. Derby has an average margin of 47-12. Brody Kooser had a key 55-yard scoring run early and scored on a six-yard run late in the win over the Salthawks. He finished with 20 carries for 169 yards. Dan Dawdy had eight rushes for 49 yards and a touchdown, and completed 14 of 26 passes for 198 yards and four scores versus no interceptions. Derby has threats on the outside with Michael Littleton, Kenyon Tabor and Kai Lemons. Littleton, not as known statewide as the other two, exploded for three receiving touchdowns last week. Derby’s defense has been outstanding, too. It held the Salthawks without a completion and limited Hutchinson’s running backs Brody Smith and Tracy Harris to 14 carries for 28 yards. In Week 3, Derby defeated Maize, 52-7, and held standout Eagle tailback Dalyn Johnson to 14 carries for three yards. In Week 2, Derby blew out Goddard, 35-6, in a game that was called at halftime due to weather. Kooser had 130 rushing yards in the victory. In the opener, Derby rolled over Eisenhower, 55-20, as Kooser (132 yards, two scores) and Dawdy (150 passing) led the offense. Its passing defense has held teams to 13 of 42 passing for 280 yards and three INTs. Derby has not lost to a Wichita-area school in the regular season since a 20-13 defeat to Maize in the 2014 season opener. Carroll opened with its 61-49 loss to Wichita Northwest and then steadied with a 40-14 win versus Salina South, followed by a 63-28 victory against Wichita West and a 45-0 win against Wichita East. Generally known for great defense, Carroll has permitted 26 points per contest. Last year, the Golden Eagles permitted 14.5 points per contest. In 2014, Carroll rolled to a 5A title behind a defense that allowed just five points a game. Last week, Carroll led East, 35-0, at halftime. Adam Theis scored twice in the first quarter, and Luke Evans returned an interception 67 yards for a score. Versus West, Theis tallied three early scores. In the Northwest loss, Theis rushed 14 times for 108 yards, while quarterback Braden Howell completed 21 of 32 passes for 222 yards. Carroll has not lost more than one regular season game in a season since a 10-3 mark in 2010 with losses to Wichita Heights and Hutchinson. Both teams should be commended for the rare matchup between the different conferences. Derby, though, is so talented on both sides of the ball and gets the win. The Indians are off to a great start, earning four wins against Topeka-area schools. Manhattan will try to make it five in a row as they travel to face the undefeated Topeka Seaman Vikings. Manhattan has outscored Shawnee Heights, Washburn Rural, Highland Park and Topeka High by a combined score of 173-45. During last week’s 46-20 win over Topeka High, Manhattan quarterback Ian Trapp rushed for 161 yards and four touchdowns. As a team, the Indians ran for 373 yards. Leading 26-20 at the end of the third quarter, Manhattan took advantage of some late mistakes by the Trojans to pull away. Trapp also passed for a touchdown in the victory. The Vikings have boasted a strong defense in their 4-0 start. Seaman pitched shutouts against Highland Park and Topeka Hayden and allowed only seven points against Topeka West. It’s an especially strong start to the season when you consider the Vikings finished 2-8 last year. Seaman hasn’t won more than four games in a season since it finished 5-5 in 2012. Seaman quarterback Dalton Cowan has passed for 431 yards and five touchdowns. The Vikings’ leading receivers are Nick Steiner with 12 catches for 154 yards and Kevin Moranz with 11 catches for 183 yards. Devon Temmon and Mike Latendresse lead Seaman with 27 tackles each. Manhattan, which beat Seaman 49-21 last year, hasn’t lost to the Vikings since 2012. It will be a battle of unbeaten teams for the two Pioneer League schools. Santa Fe Trail is unscathed in league play so far, earning wins over Osawatomie, Burlington, Anderson County and Iola. Senior Peyton Newton leads the Chargers with 796 rushing yards and 11 touchdowns on 88 carries. Senior Gage Greenfield is averaging more than 10 yards per carry, rushing for 432 yards and four touchdowns on only 43 carries. Sophomore Will Herren leads the Charger defense with 37 tackles. Coach Jayson Duncan has done a remarkable job turning the Santa Fe Trail program around. The Chargers are 19-8 since the start of the 2014 season. They were 1-26 in the previous three seasons combined. Wellsville has been stingy in its first four games, allowing no more than 12 points in a single outing. The Eagles have outscored Burlington, Osawatomie, Iola and Prairie View by a combined score of 139-26. Wellsville quarterback Trajen Smith has passed for 557 yards and four touchdowns. Daryon Winton is the Eagles’ leading rusher with 304 yards and five touchdowns on 50 carries. Reece Williams has 10 catches for 203 yards and three TDs. The Eagles edged the Chargers 14-7 last year. The two undefeated teams meet in what will likely determine the Central Kansas League title. Hoisington, 9-2 and 11-1 the last two years, owns marquee home wins versus Wichita Collegiate (31-22) in Week 2 and Washington County last Friday. The Cardinals have won 21 straight regular season contests. Hoisington continues to receive significant production from senior tailback Hunter Hanzlick, who exceeded 4,000 career rushing yards last week. However, senior running back Cam Davis has improved the Cardinals overall performance. Hanzlick has 66 carries for 578 yards and six rushing scores, while Davis has 21 rushes for 432 yards (20.6 yards per rush) with six scores. He also has two catches for 52 yards and a TD. Senior Tyler Specht has managed the offense well with 123 passing yards on 8 of 16 with one touchdown against two interceptions. He has rushed 13 times for 88 yards and two scores. Last week, Hoisington defeated Washington County, 47-6, behind 48 snaps for 512 yards. Senior Landen Urban has again led the defense with 24 tackles, while senior Ben Schneider has a team-high two sacks. Pratt has already matched last season’s win total from a 4-5 season that featured 18 points scored and permitted per contest. At this point, the Greenbacks were 2-2 in 2015. Pratt has not won more than five games in a season since a 6-4 mark in 2008. The Greenbacks won at Larned, 31-16, defeated Haven (49-13), won at Nickerson (55-26) and at Lyons (69-7). Pratt has 204 points, well more than the offensive output from 2015. The Greenbacks have an average score of 51-16 this season. Pratt has rushed for 374 yards a contest. Sophomore Travis Theis has 76 carries for 612 yards and nine scores, while senior Hunter Kaufman has 27 carries for 409 yards and eight touchdowns. In addition, Kaufman has four catches for 156 yards and three scores. Kaufman recorded 1,072 rushing and 692 receiving yards with 21 offensive scores last season. Theis had 470 rushing yards and nine touchdowns as a freshman. Pratt had 19 turnovers and was minus-9 in turnover margin last season but has three turnovers with a plus-2 margin this fall. These teams have met the last two years once Hoisington joined the CKL. The Cardinals defeated the Greenbacks in both games with a 21-7 score in 2014 and 34-14 last year. In 2015, the Cardinals followed their trends – steadily pull away behind its ground game and plenty of Hanzlick. Hoisington scored in every quarter, led 7-0 after the first, 21-7 at halftime and 28-7 after three. Hoisington had a 51-34 edge in plays and Hanzlick rushed for 169 yards and two scores. Look for a similar result on Friday. It is very challenging for opponents to play with the Cardinals for all four quarters. The two powers of Class 3A are set to do battle again. Rossville and Silver Lake own the last three 3A titles with the Bulldogs winning the past two and the Eagles winning in 2013. The Bulldogs are on a 32-game winning streak and have remained strong in 2016 despite graduating a strong class from last year’s championship squad. Rossville senior quarterback Jacob Bradshaw has passed for 531 yards and nine touchdowns. Bradshaw, who took over for All-State quarterback Tucker Horak, has also rushed for 752 yards and nine touchdowns. Cole Schumacher leads the team with 21 receptions for 303 yards and eight touchdowns. Led by the state’s all-time winningest coach C.J. Hamilton, Silver Lake is off to a 4-0 start after lopsided wins over KC Washington, Wabaunsee, St. Marys and Rock Creek. Silver Lake quarterback Dalton Dultmeier has passed for 648 yards and six touchdowns. Mason Jones leads the Eagles in rushing with 298 yards and five scores. Wyatt Heiman has 13 catches for 342 yards and six touchdowns. Three of Silver Lake’s four losses over the past two years have been to Rossville. District 2 is one of the top Class 2-1A districts with Jackson Heights (4-0), Valley Heights (3-1), Washington County (3-1), traditional power Centralia (1-3) and Wabaunsee (1-3). Any one of these teams are capable of beating the other on any given week. The beginning of District 2 action is highlighted by Jackson Heights traveling to Washington County. The Cobras moved into the rankings for the first time this year after a 4-0 start. Jackson Heights has posted wins over Northeast Kansas League opponents Immaculata-Maranatha (44-0), Pleasant Ridge (36-6), Oskaloosa (46-7), and Maur Hill-Mount Academy (59-27) last week. The Cobras, coached by Smith Center graduate Caleb Wick, went 8-2 last season, including a 21-2 loss at Maur Hill in Week 2. Two years ago, Heights lost 42-0 to Maur Hill. Wyatt Olberding leads the offense at quarterback. The Cobras rushed for eight touchdowns last Friday, including two from Olberding. Jackson Heights led 37-14 late in the first half and rushed for 323 yards. The Cobras, up 16-7 early, recovered a key pooch-kick and Olberding then scored for a 24-7 lead. Mason Hamilton had three rushing scores, including a 71-yarder. Washington County had a high-profile road contest versus Hoisington, ranked in Class 3A. After three victories when the Tigers allowed just 30 points, Washington County lost 47-6 to the run-heavy Cardinals. The Tigers are 13-2 under second-year coach Doug Thompson with both losses to Hoisington, the first time in the Class 3A playoffs last year. Hunter Kier leads the backfield for the Tigers. The Cobras have a little too much depth and earn the victory.